Pyewacket is a 15-year-old kitty who developed diabetes around age 10. 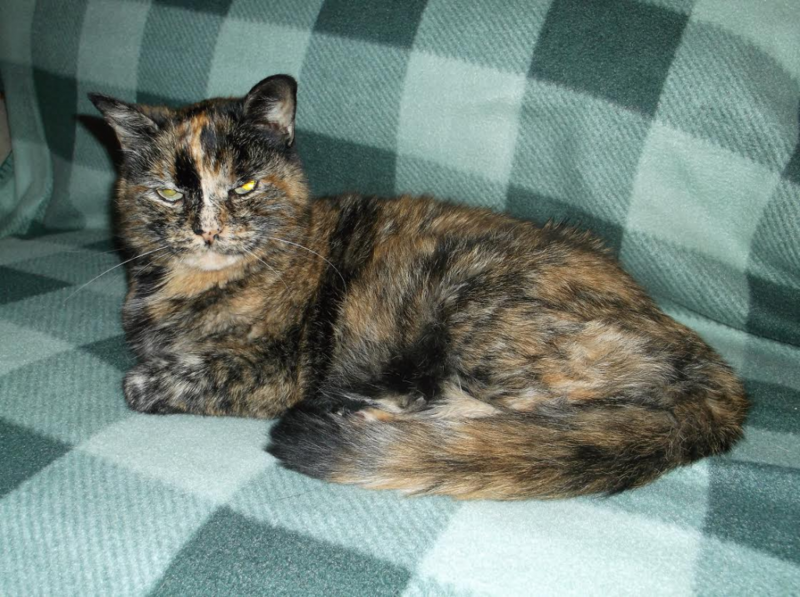 This cute little tortie is doing fine now, but this wasn’t always the case. Her human, Rhiannon, wrote me to share a cautionary tale she thought other cat caretakers would benefit from. 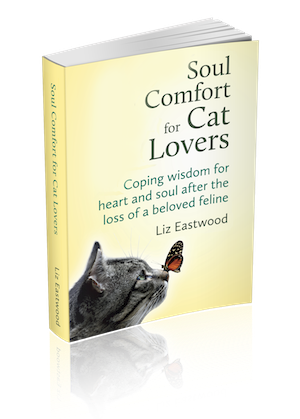 She was very generous to come forward and I agreed that we needed to share what she learned so other cat lovers can protect their cat from going through what Pye went through. It’s a story about how (yay!) we can often turn feline diabetes around with diet, BUT there are potentially fatal dangers in not doing it right – it’s about how to avoid a tragic mistake that has happened all too often. Rhiannon was giving Pye 12 units of insulin a day and her diabetes still wasn’t under control. She began to learn more about feline nutrition and found that a low carb, high protein diet could turn feline diabetes around. One study found that 68% of diabetic cats fed a carbohydrate-restricted canned diet no longer needed extra insulin at all (according to Antech Diagnostic News, December 2003). So Rhiannon decided to try a low carb food. Her cat did so well that after two months, her blood sugar was normal with just 2 units of insulin daily – which sounds great at first, but suddenly, unexpectedly, things went terribly wrong. Six to eight weeks is usually how long it takes a cat to adjust to new food, so Rhiannon thought (and her vet didn’t contradict her) that Pye’s insulin requirements had stabilized. But about two weeks after she last had her cat’s sugar checked, Pye’s pancreas “woke back up” and started producing insulin — suddenly she was getting too much insulin, which is very dangerous! This meant her cat was essentially starving to death, with no sugar in her blood to sustain muscles, heart, and brain. It also caused dehydration that weakened her kidneys. All this happened in less than two weeks. What fooled Rhiannon was the fact that Pye’s symptoms of too much insulin were identical with what too little insulin looked like. So, for the first week, Rhiannon thought her insulin had just gotten old and she wasted time and money getting a fresh bottle! …and by the time you realize your cat had too much insulin, it could be too late. The good news is a low carb diet can shift diabetic cats into remission. The bad news is that there are life-threatening risks in doing this without frequent testing (at your vet’s office or with home tests) because you no longer know exactly how much insulin to give as the pancreas starts producing again. As Dr. Pierson explains, if your cat is receiving insulin and you switch to a low carb (eg, grain-free) diet without lowering the insulin dosage properly, you will be putting your cat at significant risk. After her ordeal, Pye was put on a low-protein diet temporarily, supplemented by potassium, and recovered. But as you can imagine, the whole episode was really hard on her and Rhiannon was worried about her kidneys being able to rally after all that. The good news is that, over a year later, she’s stable and happy on a low carb, grain-free diet again, with 8 units of insulin a day. But, Rhiannon also wanted to suggest cat caretakers think carefully before you put a cat on prednisolone (steroids), as it may trigger diabetes for some cats. Pye had severe gingivitis when she was adopted and the vets put her on prednisolone for it, but it didn’t prevent Pye from having to have all her teeth removed, and Rhiannon later found out steroids can tip a predisposed cat into diabetes. Also, there was another set back when she was talked into trying a “prescription” Metabolic Diet food for Pye. It was supposed to be good for diabetic kitties and fill them up, but the diet not only made her cat beg for food MORE, three weeks into the change, Pye started throwing up. So it seems the food was irritating her stomach, and Rhiannon believes it could have led to Inflammatory Bowel Syndrome if she hadn’t taken Pye off of it. Fortunately, after a two-day hunger strike, Pye was willing to get back on her grain-free wet foods again and is doing great again! Excellent details on in-home blood sugar monitoring for cats, including what’s involved and product recommendations are in this FAQ and protocol by Dr. Hogkins and this article by Dr. Lisa Pierson. Dr. Elizabeth Hodgkins has a comprehensive site for helping you with your diabetic cat, focused around a very specific, successful low carb diet and insulin management protocol, and there are forums provided for extra support too: YourDiabeticCat.com. My vet said she has seen 3 cats in ten years go into remission so lottery odds. Shall feed mine normally and just up insulin. Home testing is a crucial part of managing a diabetic cat’s care no matter what diet you feed, but ESPECIALLY if you’re going to feed raw or low-carb, grain-free canned food. I have a diabetic kitty who’s been in remission for almost 3 years now, and I can’t even imagine having a diabetic cat without home testing. FelineDiabetes.com and the Feline Diabetes Message Board (where I learned most everything I know about diabetes management) are great resources, whether you are new to owning a diabetic cat or you’ve had one for years and haven’t had the chance to learn everything you might want to know. I’m glad to hear Pye is doing so well! Don’t ever give anyone – animal or human – insulin without knowing what their blood glucose level is. Shooting blind risks them going into hypoglycemic seizure which can be fatal. Testing is an essential step. I can’t emphasize this enough. Insulin isn’t a drug, like an aspirin, where you say, “I have a headache so I’ll take an aspirin because I know an aspirin always make the headache go away.” Inulin is a hormone, and it works differently. The modern insulins, such as Lantus and Levemir, are what are called shed or depot drugs. They build up a little reservoir in the body, and with insulin therapy your goal is to gently and gradually stabilize your cat’s blood sugar level. There is a protocol for this, called the Tight Regulation Protocol, which is the only published feline diabetes prototol, and cats who go on it within the first 6 months of being diagnosed have an 80% remission rate. Long-term diabetics, such as my cat, still have a 1 in 3 chance of remission, and live healthy, normal life spans. dinner time, 12 hours later, you test their blood glucose level and feed and shoot. Two hours later you test their BG. You put all of this down in a spreadsheet because it’s this helps you know when to change the dosage. What you’re aiming for is the NADIR. The nadir is when the insulin is at its most effective in your cat’s body, and that could be at 4 or 6 hours after the shot. When you see consistently good nadirs, you incrementally reduce teh amount of insulin you are giving. In this way, you gently bring your cat’s BG levels down, SAFELY, and if you’re lucky the cat’s pancreas will kick in and start producing insulin on its own. The more you have your cat in that safe, healing blood glucose range, the more likely it is that your cat will go into remission. Some cats never do, Some go into remission and don’t stay there, and may return, and other cats go into remission and stay. However they are always diabetics and have the potential to go back into high BGs so you always have to be careful to keep them on a low carb diet, which is healthier for all cats, anyway. I know this is a lot of information and it initially overwhelmed me and took a while to wrap my head around understanding how insulin works and how to treat diabetes, but the good news is that there’s an online group, http://www.felinediabetes.com, that’s been around since the 90s and has helped many people, including me, safely treat their diabetic cat. There’s a wealth of information there, and on the message boards you can pretty much get 24/7 help from caring members. I’ve had people sit up with me all night while I was learning how to regulate my cat. I had a diabetic kitty, named Tippy, many years ago. She was 16 when it was found and her pancreas just started working again after about a year on insulin. The vet I had at that time told me that sometimes the pancreas of a diabetic cat would start working again and I kept a bottle of Karo Syrup on hand just in case her glucose level should unexpectedly drop. Then, one day when i went to give her insulin to her, she suddenly had a seizure before I could give her the insulin injection which thankfully let me know that somehing was wrong. Suspecting that probably her glucose level was low, I gave her some Karo Syrup and took her to the vet where I found that her pancreas was working again. Unfortunately, she had other problems as well and soon passed away at age 17. Oddly enough, I also had a 14 year old diabetic dog at the same time and I was giving out 6 insulin shots a day total for about a year. They both passed away close together too. It’s wonderful that Pye is doing so well! Best wishes for continued success and many more happy years together!